Place 1 cup almond flour and 1 cup pitted dates in a food processor and process into a thick flour. Pour the mixture into a large mixing bowl and add in 1/3 cup shredded coconut and 3 tablespoon warm water. Mix Well. 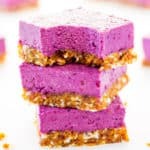 Place 1 cup blackberries, 1 cup cashews, 1/3 cup maple syrup, 1/2 cup coconut oïl, 1 tablespoon lemon juice and 1 tablespoon vanilla extract in a food processor and process until smooth. Remove the base from the freeer.